International Language Services was founded with the underlying goal of providing accurate document translation services for companies expanding their reach into the global marketplace. We recognized that quality translations provided by native speakers with specific industry expertise were the key to success. Our ISO 9001:2015-certified translation services cover the globe and serve a broad range of industries and clients, from start-ups to Fortune 500 corporations. Our professional translators with specific industry experience, state-of-the art project management tools, and our experienced project managers and support staff all work together to provide cost-effective translation services to meet the most stringent requirements, in 180 languages. For every industry, top quality is assured by our ISO 9001:2015-certified processes and our dedication to accuracy and on-time performance. When you choose ILS as your translation partner, you can count on completed industrial and manufacturing translations that meet the highest standards of excellence, for any global market. The international marketplace is highly competitive. 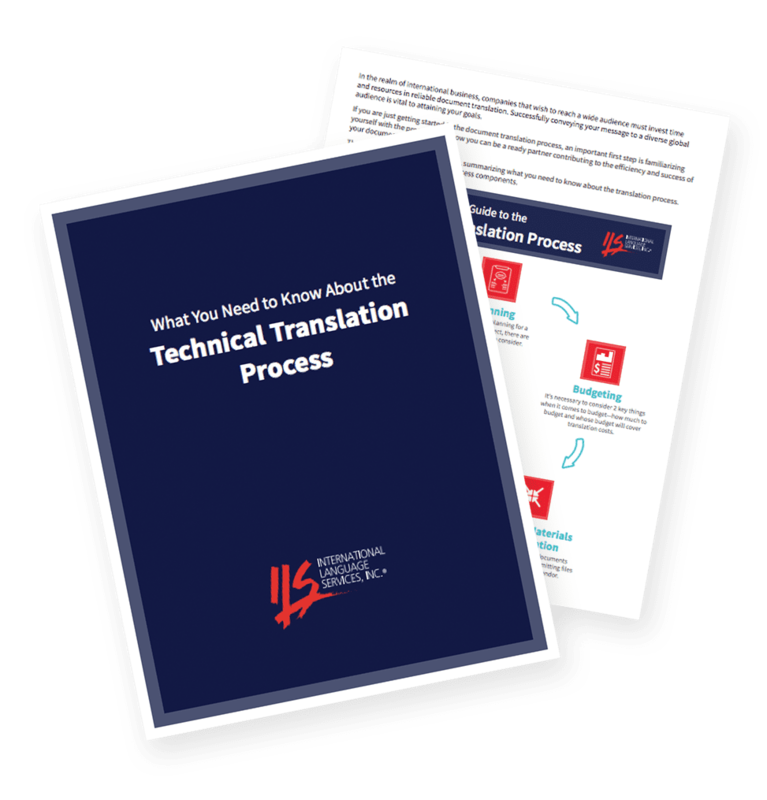 When it comes to the translation of user manuals, safety instructions, marketing literature, and other technical documentation for your products, consistent and exceptional quality should be the highest priority. While cost is a concern, poor translations can quickly derail your marketing efforts, customer acceptance, and end user safety. At ILS, accuracy is never compromised. We consistently provide translated materials that mirror the message and tone of original source files to represent your company and products faithfully and effectively. Whatever your industry, success in your global markets requires consistency, flawless accuracy, and clarity in translation of everything from user and maintenance manuals to software interfaces and websites. Whether you need translations for a single international project or multilingual documentation for multiple markets, our native translators in over 180 languages and our commitment to top-quality performance make ILS a one-stop solution for all of your localization requirements. Have questions we haven’t answered?